The subject matter of American Made is interesting and outrageous and the fact that is it based on true events makes it all the more intriguing. American Made is based on the true story of Barry Seal (Tom Cruise; Mission: Impossible – Rogue Nation). It's a fascinating tale of drugs, greed, guns and wealth that involves the governments of a number of countries including the United States. It chronicles Barry's life as he "worked the system" while getting involved in a number of illegal activities and dealing in covert operations. As the movie heads to stores in time for a new year, Universal Studios offers it in 4K Blu-ray, Blu-ray, DVD and Digital Download with the Former combo pack offering lots of treats for viewers to enjoy. In the late 1970's Barry was working for TWA airlines a commercial pilot. Occasionally he would smuggle Cuban cigars into the country illegally, which managed to get him noticed by CIA Agent Monty ‘Schafer' (Domhnall Gleeson; Ex Machina). Schafer approaches Seal with a proposition to covertly (sort of) take aerial photos of guerrilla camps in South America. On one such trip Seal is approached by the Columbian drug cartel to run drugs from South America to the United States. Unfortunately, things don't go quite according to plan and Seal ends up arrested. Upon his release, Seal is once again approached by Schafer to run other "missions" for the American Government. Suddenly, Seal is delivering guns to the Sandinistas while concurrently smuggling drugs for the Columbians. He is making a ton of cash, living large in a little town in Arkansas, and playing the government and the drug cartel. However, it was only a matter of time before everything came crashing down and of course, it eventually did. Seal is caught by numerous government agencies, is found out to be a government informant by the drug cartel and is convicted of drug smuggling. Unfortunately, The drug cartel catches up with him and the real-life Seal was murdered in 1986. Cruise really proves himself in this role as the charismatic Seal. His natural charm lends itself to this meaty role and he once again shows why he is a box office star of the highest caliber. Gleeson is a smart choice for CIA agent Schafer. His "boy next door" look gives Schafer an air of innocence that suits the character. Sarah Wright (The House Bunny) as Seal's wife, Lucy, matches Cruise at every turn and holds her own against his star power. The rest of the supporting cast is also great and the overall feel of the film is excellent. The 4K Blu-ray is visually stunning with 2160p video quality and a 1.85:1 aspect ratio. The jungles of South America are lush and green while the roads of Arkansas are dusty and dry. The aerial shots and broad and terrific and the set design truly encapsulates the 1980's. The DTS-HD Master Audio 5.1 is fantastic, especially during the flight scenes. The viewer can feel the plane moving from one side of the speaker channel to the other and the dialogue is mixed well with the sound effects. The 4k Blu-ray Combo pack also offers a number of interesting extras including: Deleted Scenes, American Storytellers, Cruise & Liman: A Conversation, In the Wings, Shooting American Made, Flying High, and The Real Barry Seal. While they all offer interesting insights into the story, my favorite was the featurette about the real Barry Seal told by one of his sons. The subject matter of American Made is interesting and outrageous and the fact that is it based on true events makes it all the more intriguing. Director Doug Liman (Edge of Tomorrow) also presents it in a way that engages the audience and makes the over two-hour running time flyby (pun intended). Download American Made from the iTunes Store in Digial HD. 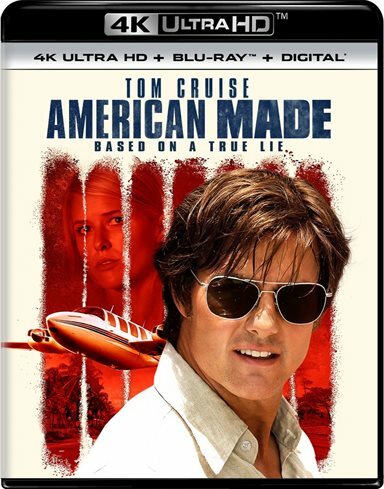 For more information about American Made visit the FlickDirect Movie Database.